Shazam has extended its box office streak into a second weekend. Shazam added $25 million to bring its total gross to $94.9 million. The film is based on the DC Comics hero and stars Zachary Levi (Chuck). Shazam was followed by weak debuts from Little ($15.5 million) and Hellboy ($12 million). In Little, Regina Hall plays a woman who is transformed into her younger self. It has a B+ CinemaScore. Hellboy stars David Harbour (Sheriff Jim Hopper in Stranger Things) as Hellboy. It is not likely to recover from this surprisingly small opening. It has a C CinemaScore. Hellboy was followed by Pet Sematary, Dumbo, Captain Marvel and Us. After - a drama adapted from an Anna Todd novel - opened in the eighth position and made just $6 million. It was followed by the animated Missing Link, which had an even weaker opening - $5.8 million in 3,413 theaters, for a $1,712 per theater average. You can find the box office chart for the weekend here. 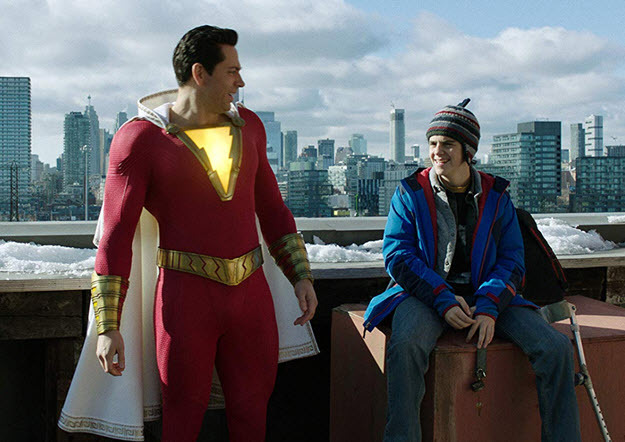 It is difficult for films to top the box office for three consecutive weekends but Shazam does have a shot. There is not a lot of buzz about this weekend's new films: The Curse of La Llorona, Penguins and Kalank.